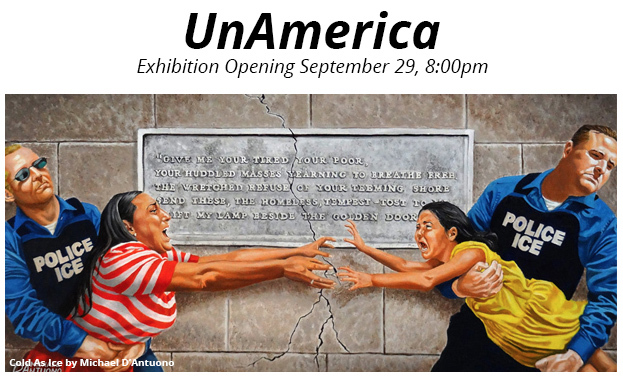 UnAmerica is an art exhibition opening Sept 29, 2018 concerning the hot button immigration issue as we face the upcoming 2018 midterm elections.The national discourse is drowned out by controversy, xenophobic scapegoating, misinformation, inflammatory claims and nativist fear-mongering in place of constructive dialogue regarding much needed immigration reform. The Puffin Cultural Forum seeks to highlight and explore issues surrounding immigration through an exhibition entitled UnAmerica, scheduled to run to November 4. The oil painting featured above is titled Cold As Ice by Michael D’Antuono. It is 24″ x 48″ oil on canvas. Featuring artists: Andrea Arroyo, Boldface, Janet Braun-Reinitz, Patricia Carzola & Nancy Saleme. Michael D’Antuono, Melissa Eder, Elizabeth C. Frischauf, Felipe Galindo, Isabelle Garbani, Kirk Maynard and more. Opening features participating artists and musical performance.